In this series we will be answering the most popular questions, but not just giving you the answers… our mission is to help you actually understand these concepts to become a safe and knowledgable drone operator. In this episode Ethen and I will help you understand altitude and explain the difference in AGL and MSL. What a blessing it is to have over 13,000 people pass their Part 107 using our course! You can imagine that with this many users we have a good handle on what the frequently asked questions are. In this series we will be answering the most popular questions, but not just giving you the answers… our mission is to help you actually understand these concepts to become a safe and knowledgable drone operator. In this episode we will cover use of sUAS in the United States that are registered in foreign countries. Where is Part 107 currently and where will the FAA be taking it in the future? I’ll share that with you in this quick video. What’s the secret to getting Part 107 Authorizations and Waivers approved? In this video I’ll share with you some of my best tips and how to speed up the process. Where will the part 107 waiver and authorization process be in 6-12 months? Let me share with you what we learned directly from the FAA. 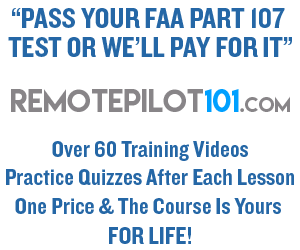 Have you also seen our video on the secret to earning FAA Part 107 authorizations and waivers the first time? CLICK HERE to watch it. Actually registering the drone is easy. It’s the other questions you have that bring up other concerns. Should I register as a hobby or commercial? What if I’m only going to fly commercial just once or twice? How does the FAA define commercial operations? What if I buy the drone from someone else or want to sell a drone that’s registered to me? In the two videos below I answer those questions. We get to see all of the FAA trick part 107 questions. In this video I select 3 of them and share with you the right answers. Instant airspace authorizations, flights beyond VLOS, and flight over crowds all coming soon?! Did you know that to date the FAA has only approved 81 airspace authorizations. I’m proud to say we’re one of those. Nearly 1,000 have been submitted yet the FAA is throwing out nearly 90% of them! Why is this the case and how can you get yours approved? I’ll share some of that in this video.